Early written records described the giraffe as "magnificent in appearance, bizarre in form, unique in gait, colossal in height and inoffensive in character." Ancient cultures in Africa revered the giraffe, as some modern cultures do today, and commonly depicted it in prehistoric rock and cave paintings. Unknown outside of Africa, this animal so excited man's curiosity that it was sometimes sent as a diplomatic gift to other countries; one of the earliest records tells of a giraffe going from "Melinda" (presumably Malindi) in Kenya to China in 1415. The animal was thought to be a cross between a camel and a leopard, a mistake immortalized in the giraffe's scientific name of Giraffa camelopardalis. 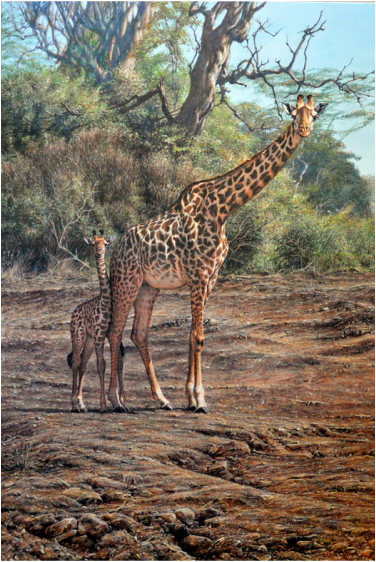 The giraffe is the tallest living animal, uniquely adapted to reach vegetation inaccessible to other herbivores. Giraffes have a distinctive walking gait, moving both right legs forward, then both left. At a gallop, however, the giraffe simultaneously swings the hind legs ahead of and outside the front legs, reaching speeds of 35 miles an hour. It has unusually elastic blood vessels with a series of valves that help offset the sudden buildup of blood (and to prevent fainting) when the head is raised, lowered or swung quickly. Giraffe "horns" are actually knobs covered with skin and hair above the eyes that protect the head from injury. Giraffes are found in arid and dry-savanna zones south of the Sahara, wherever trees occur. The giraffe is non-territorial and social; it lives in very loose, open herds with no specific leaders or coordination of herd movement. This structure reflects that a giraffe’s size makes a “safety in numbers” tactic unnecessary, and that the trees they feed on tend to be spaced apart. Dominance between males is established by “necking”—swinging heads at one another in tests of strength. Nursery groups of young animals are left alone together during the day while their mothers feed. The 6-foot-tall calf grows rapidly as much as an inch a day. By 2 months the young giraffe is eating leaves and at 6 months is fairly independent of its mother. A young giraffe can even survive early weaning at 2 or 3 months. Although few predators attack adult giraffes, lions, hyenas and leopards take their toll on the young. Scientists report that only a quarter of infants survive their first year of life. When protected, giraffes can flourish in areas where food is abundant year round. Although they drink water when it's available, they can survive where it is scarce. They occasionally eat grass and fruits of various trees and shrubs, but their principal food source is the acacia tree. The tree's sharp horns do not seem to stop the giraffe, which has a long, muscular tongue specially adapted to select, gather and pluck foliage. The giraffe is a selective feeder and although it feeds 16 to 20 hours a day, it may consume only about 65 pounds of foliage during that time. It can maintain itself on as little as 15 pounds of foliage per day. Giraffes move in loose herds on the open woodlands and grasslands of the African Savannah. Eating mostly at dusk and dawn on leaves and fruit, the Giraffe’s main food source is the acacia tree. They will drink where possible, but can survive where it is in short supply. To drink, a Giraffe must spread its front legs so its head can reach the water. It has a distinctive walking style as it moves both legs on the same side forward at the same time. At a gallop, the Giraffe can reach speeds of up to 55 km/hour and rhythmically moves its head backwards and forwards to pull forward its weight. Mating can occur at any time of the year and calves are born after a gestation of 16 months. When caring for their young, the female Giraffe will leave their calves together during the day to feed. A calf will grow very fast when young, even up to an inch per day. By two months, the calf will be feeding on leaves and by six months, it will be quite independent of its mother. Full grown, a Giraffe will grow up to four to six meters and live up to 28 years (in captivity, not as long in the wild). 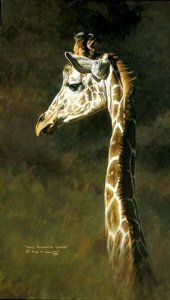 The Giraffe does not have many predators, but if threatened, the Giraffe has two defence methods, it will kick it’s aggressor with its front legs or it will use its long neck and densely boned skull as a mallet against another Giraffe. The main predator of the Giraffe is the human. Not many African animals will attack a full grown Giraffe, but a calf will be attacked, usually by a Hyena. Giraffe’s tongue’s are blue and can extend more than 40cm long. Each Giraffe has its own unique pattern of coat markings. There are nine species of Giraffe. 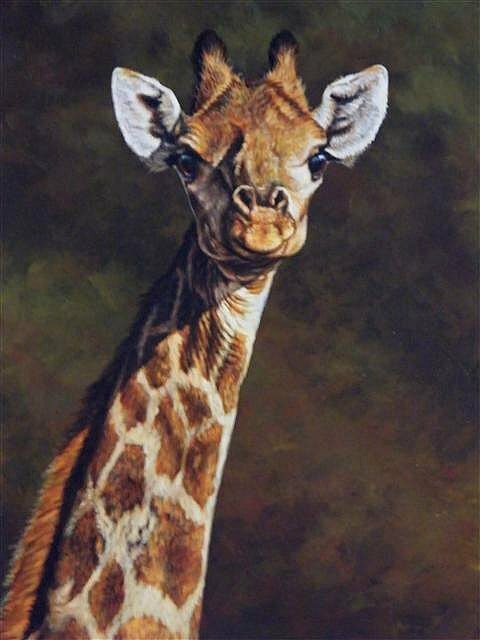 The Giraffe has seven neck vertebrae like a human, despite its long neck. A Giraffe stands while sleeping. It is the tallest of all living land mammals. Even though the Giraffe is a quiet animal, it does make a distinctive flute-like noise as well as grunts and moans. It has a sharp sense of hearing and can alert animals of nearby predators. Giraffe are not territorial; however they will stay within a certain area and have a male hierarchy.